I was pleased to read that the Ready Player One movie premiered at SXSW to decent reviews, and no doubt a few sighs of relief. I'm yet to see the film, but like many people I found Ernest Cline's novel a bit too heavy handed with its masturbatory pop-culture references, even if I could appreciate why it captured so many imaginations – and eventually Steven Spielberg's eye. To be honest, the trailers and those movie posters did little to put my doubts at ease leading up to the movie, but beyond the DeLoreans and (admittedly great) use of A-ha, the arrival of Ready Player One feels particularly prescient in 2018. When the book was published in 2011, the very first Oculus Rift hadn't even hit Kickstarter; VR was still considered a failed experiment of the 90s. Now, virtual reality headsets flood the market and the technology that Cline once envisioned for 2044 no longer asks for such great leaps of the imagination. 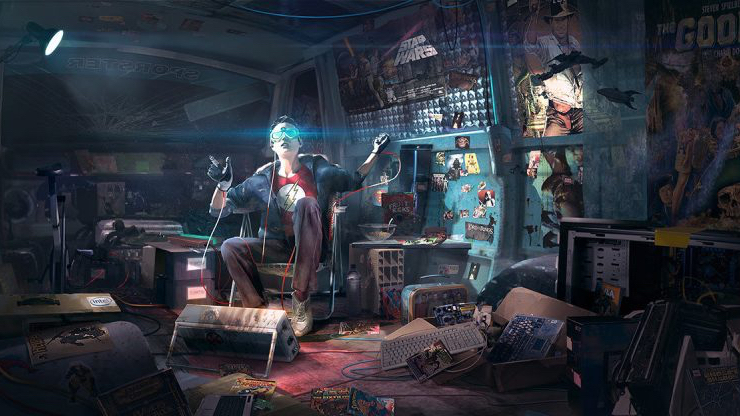 To make the whole event seem even more surreal – and a little meta – HTC Vive and Warner Bros. have teamed up to produce a handful of games based on the Ready Player One universe. They're designed to promote the film, sure, but they might also get you thinking about the state of VR in 2018. There are eight experiences in total, all of which will be launched between now and the movie's release on 29 March. These games are quite arcade-y, but mostly more substantial than your run-of-the-mill movie VR tie-ins (of which I've played so, so many). In fact, my favourite two were the most arcade-style of the lot, Smash and Fracture, both of which seem to be custom versions of VR game Arcade Saga from 2 Bears Studio. Smash is basically Pong from the future, having you bat balls down a hallway with a computer opponent on the other side. Fracture is more like Breakout, as you bat a ball against cubes around a room, earning points as you destroy them. They're simple, but they're the sort of game that get us coming back to VR here at Wareable – just ask Mike. Gauntlet, a dungeon game in which you roam around firing arrows at skeletons and doing strange hand motions to collect gold, felt repetitive despite its more exploratory design. But I think that's maybe also kind of the point, emulating a once-vision of the future that paired amazing technology with unimaginative game design. But if that's also what Steel Wolf Studios was gunning for with Battle For The OASIS, it missed. This one's easily the weak link, a dull, repetitive wave shooter that has you blasting away enemy soldiers of the movie's IOI conglomerate. Similar, but much better, is Rise Of The Gunters, a shooter in which you roam around with two other players, collecting power-ups of burgers and cherries dropped by dead soldiers and taking down colourful Space Invaders-esque enemies above (complete with retro arcade machine noises for added retro mashup effect). It's the game that probably best sums up Ready Player One, and although it's probably not one I'll return to, I did appreciate how the locomotion felt smooth despite how frantic everything was, meaning I didn't come away nauseous. For the last one I tried I was using the Vive Pro with the wireless adapter, which led me to punch the wall on more than one occasion, much to the amusement of the chaperone in the room. But it was at this point that I couldn't help but think about how the quality of the VR today compares to that portrayed in the novel, and to what has come before. As I removed the headset I thought back to the very first time I put on the Oculus DK1 in 2013, and all the times in between. We've come so far since, and if there's one wish I have for the movie (other than for it to actually be good) it's that it helps further fuel the imaginations of VR creators everywhere to keep pushing. We're not at the OASIS yet, but honestly I don't feel like we'll need to wait until 2044 for it to arrive.